GIJC19 will feature over 150 exciting panels, workshops, and networking sessions, ranging from cross-border collaboration and corruption to advanced data analysis. GIJC will have special tracks on documentaries, sustainability strategies, safety and security, and more. Here’s a chance to learn from the best in the field and enhance your skills with the latest tips and tools. With the support of our sponsors, the conference is offering more than 200 fellowships to both established and young promising journalists in developing and transitioning countries, and for journalists from specific communities such as LGBTQ and indigenous peoples, to participate in this prestigious event. 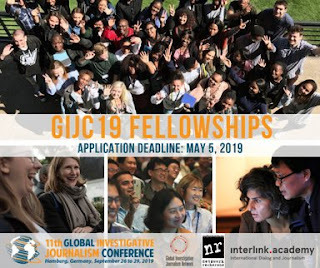 Competition is keen so you need to convince us that you will make great use of the training GIJC19 offers. 05 May 2019. Successful fellows will be notified via email by June 30, 2019.